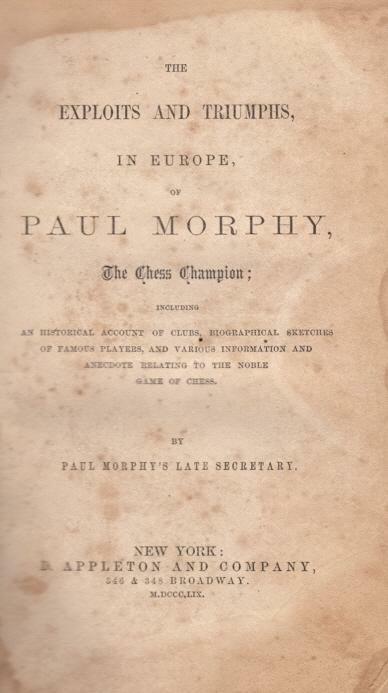 Given the interest in the relationship between Frederick Edge and Paul Morphy and, more generally, the Staunton-Morphy affair, an overview is offered here of historians’ previous efforts to set out the facts and analyse the issues and personalities involved. Included too are the fruits of our own researches in Chess Notes into Edge’s background, together with some suggestions for further reading. 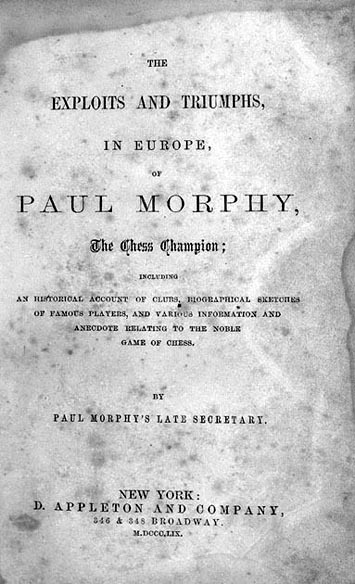 Paul Morphy The Chess Champion by An Englishman (London, 1859). ‘Whether Edge acted as Morphy’s valet as well as his secretary in England (as he very evidently did in France until the last few weeks there) is not clear, but most likely he did for part of the time. 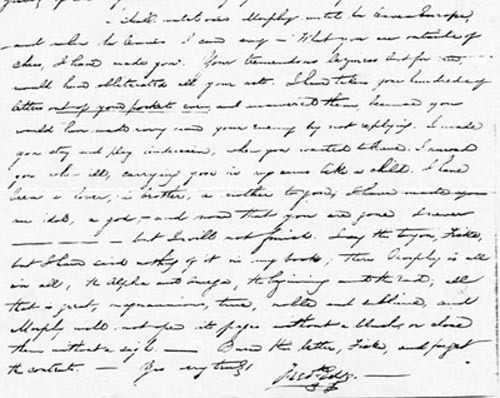 It is possible that Edge contributed to the strain that developed between Morphy and Staunton, although it is not at all apparent in his first letters to Fiske reporting Morphy’s activities. 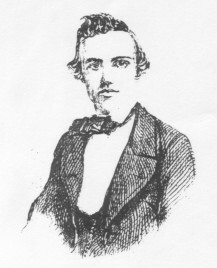 Morphy’s dislike for letter writing and details allowed Edge to become a large factor in his life in England and France. But for Edge, New York and New Orleans would have had almost no word about Morphy’s doings except for the reports on some of his games in the London papers. And certainly without Edge many games would not have been recorded and given to the press. ‘On hearing this, I began to talk the matter over quietly with him [i.e. discussing with Morphy the prospect of meeting Anderssen], asserting that his voyage to Europe was useless, if he did not play Anderssen. All was to no effect. Morphy did not appear to have the slightest ambition, say what I would to him. He must be at home in December; he had promised to be there, and home he would go. Very well; Morphy and I were at daggers drawn and we began our fight. He said he would go, and I said he shouldn’t. He wanted to know how I could prevent him; I told him that all the clubs in Europe would stop him. “Very well”, answered he, “I’ll be stronger than all Europe.” “Bravo”, says I, “that’s spirited, at all events.” Says he – says I – says he – and Morphy went to sleep and I to work. The reaction to Edge’s book in the main contemporary magazines was not particularly positive or extensive. 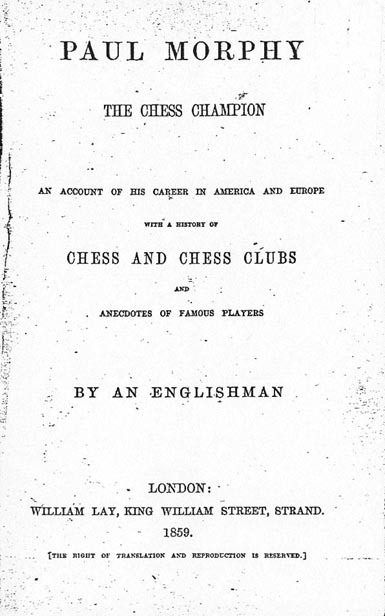 An example is the Chess Monthly (New York), which was edited by Daniel Willard Fiske (1831-1904) with, for much of the time, Morphy listed as co-editor. ‘... When I read that cruel notice in the Monthly I sent you a communication which, in the heat of offended pride, I threatened to publish as a vindication of myself. Cooler judgment has shown me that it is nobler to suffer. Besides, I do not envy your feelings, and, above all, do I not envy Morphy’s. His southern pride may, for the moment, overpower generosity, but conscience must, sooner or later, torture him for returning malevolence for kindness. When flatterers cease to charm him, he will come to one who never flattered; and he will form a low opinion of those who abetted him against one who, in spite of any former difference, proved himself one of the best, if not the best, friend he ever had. At that time Staunton was no longer connected with the Chronicle, but he called Edge’s book ‘a contemptible publication’ on page 501 of his book Chess Praxis (London, 1860). Murray wrote detailed articles about Staunton in the 1908 BCM (November, pages 465-470 and December, pages 513-522). On page 518 he described Edge’s book as ‘a work which deals with the Staunton-Morphy episode in a strongly anti-Staunton manner’. Edge’s name also cropped up, of course, in two books by P.W. Sergeant (1872-1952): Morphy’s Games of Chess (various editions from 1916 onwards) and Morphy Gleanings (London, 1932). Both works have been reprinted by Dover Publications, Inc., the latter under the title The Unknown Morphy. ‘... Now, Fiske, I can from the depths of my soul declare, looking God in the face, that had it not been for me, you wouldn’t have seen 20 of Morphy’s games - the correspondence with Staunton wouldn’t have been written, and Morphy would have gone back humbugged and a laughing stock. I made him stay and play Anderssen, and I have stood invariably between him and his enemies; and conspiracies have been dangerous in Paris, I assure you - in the salons - by Morphy’s own fault. I can say, never did man more devotedly serve another. I neglected my wife for him, accompanied him to Paris and left her till broken-hearted she came to fetch me back. I put a coldness between myself and all my family which only years will heal, and I don’t, even now, know why. I am not a chess-player, I am not an American, I have nothing to hope for from Morphy, and I would not say what I have herein written, to anybody but you, and you will be guilty of an infamous act if you let anyone see this letter. I shall watch over Morphy until he leaves Europe, and when he leaves I can say - “What you are outside of chess, I have made you. Your tremendous laziness, but for me, would have obliterated all your acts. I have taken your hundreds of letters out of your pockets even, and answered them, because you would have made every man your enemy by not replying. I made you stay and play Anderssen, when you wanted to leave. I nursed you when ill, carrying you in my arms like a child. I have been a lover, a brother, a mother to you; I have made you an idol, a god - and now that you are gone, I never -- but I will not finish. I say this to you, Fiske, but I have said nothing of it in my book; there Morphy is all in all, the Alpha and Omega, the beginning and the end; all that is great, magnanimous, true, noble and sublime, and Morphy will not open its pages without a blush, or close them without a sigh. - Burn this letter, Fiske, and forget the contents. ‘From Edge onwards, writers have noted Morphy’s effeminate appearance and manner, and obviously the possibility of homosexuality must have been pondered for more than a century. Our quotation may have caused some readers to ask this question. That is nothing new. ‘After I was fortunate enough around January 1987 to secure a copy of the complete text of the letter from another source I was astonished to discover it had no sexual material at all; it was not addressed to Morphy as the insinuendo implied. At last the insinuendo was revealed as a gross error in construction, a cunning deception, a phantasm, a hoax, a fabrication, a humbug, a flim-flam, a disgrace – take your choice. In the revised (1992) edition of The Companion Edge had an entry of his own, and the ‘lover’ passage (19 words) was given there (page 120). Despite the earlier protestations of readers, Fiske was still not mentioned as the recipient of the letter. Moreover, since the full text of Edge’s letter had been given in Chess Notes in 1987, The Companion’s use of the word ‘unpublished’ was wrong. Nor were these matters corrected in the 1996 paperback edition of The Companion. The September-October 1983 issue of Chess Notes (C.N. 524) included some information from Whyld. Edge’s death certificate stated that he died on 28 May 1882 (i.e. about two years before Morphy) at King’s College Hospital, London, aged 52. He was described as a literary author of 14 Hanway Street, Oxford Street, London. ‘We have been trying to piece together a little more about Edge’s private life, the starting-point being King’s College Hospital, where he died on 28 May 1882 (C.N. 524), the cause of death being extravasation of urine. It was a painful end, as the record of the post mortem examination makes clear. We are not authorized to offer copies of this report, but interested (non-squeamish) readers may apply direct to: Mr A.J.B. Mussell, Archives Assistant, King’s College London, Strand, London WC2R 2LS, England. One other note in the records: Edge did not return his locker key until 31 December 1853, and thereby forfeited his 5/- deposit. It was not usual for keys to be returned after a student had gone down, but to return one so long afterwards is perhaps a little out of the ordinary. However, what is more striking is Edge’s age at entry; at 20 he was rather old, the average age at the time being 16-18. King’s College also has correspondence from F.M.E.’s father, Thomas Edge. We have photocopies. Edge père was a manufacturer and installer of gas-lamps, and in the early days of the College seems to have been one of their principal contractors. His business was variously called the Gas Light Office, the Lamp and Chandelier Manufactory and the Gas Fitting Manufactory, but the address remains as 59 Great Peter Street. It will be recalled that it was from there that Frederick wrote the letter to Fiske given in C.N. 840. The Archives Department of the Victoria Library (City of Westminster) has confirmed that Thomas Edge “appears to have begun as a Brassfounder and Gas apparatus manufacturer”. Various London directories show that in 1826-7 he was listed as a Brassfounder at 58 Great Peter Street and a Gas apparatus manufacturer at 59 Great Peter Street. By 1863 he was listed at 16 Regent Street (near to Horseferry Road), but the following year Thomas Edge Junior appears to have taken over the company, at the same address. The census returns indicate that Emily was born at St Helier, Jersey, the second link with the Channel Islands. This seemed unlikely to be a coincidence, given that the total population of Jersey and Guernsey in 1851 was under 87,000. From the Guille-Allès Library, St Peter Port, Guernsey we learned that Frederick’s tutor, John Richardson (died 1856), was the Classics master at Elizabeth College, Guernsey from 1845-1847 and then, for an unknown period, Mathematical master. Later, he became curate of the Castel Parish Church. The Elizabeth College register, however, lists only Frederick’s brother, Thomas: “born at Westminster, November 24, 1818; son of Thomas Edge; left 1831. Gas engineer and gas meter and apparatus manufacturer”. Frederick may have become the private pupil of Rev. 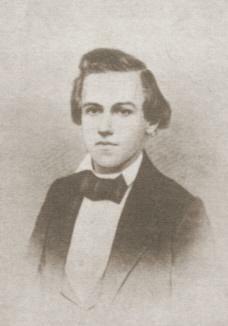 Richardson after the latter left the College. In this connection it may be noted that the 1984 edition of The Companion (page 217) gave ‘Frederic Milnes’, the 1987 paperback version (page 217) had ‘Frederick Milnes’, and the 1992 edition (page 119) put ‘Frederick Milns’. 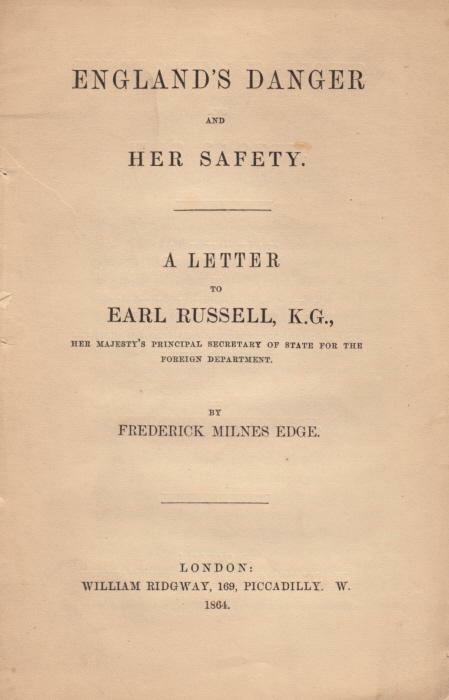 The front cover and title page of the Dover reproduction of Edge’s book used Frederick ‘Milne’. It is certainly difficult to know how his second forename should be spelt. The title page of Slavery Doomed had ‘Milnes’. 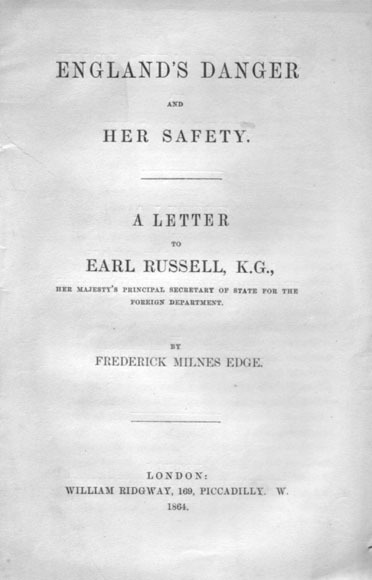 So did, for instance, England’s Danger and Her Safety, another Edge work (London, 1864). ‘Frederick Milnes Edge’ appeared on both the title page and page 31. Since the above was written (i.e. in the mid-1980s) no further biographical information of substance about Frederick Edge seems to have come to light. 3 April 1859 (page 148). 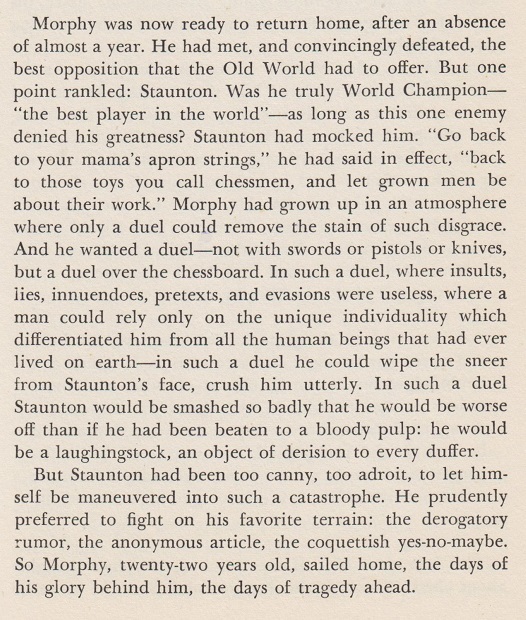 ‘There has been some talk that Morphy was unduly influenced by Edge, especially on the matter of the Staunton match, but we have seen that Edge was more confident than Morphy that the match would ultimately take place. In any case, Morphy was a self-willed person, and he made his own decisions. Edge always played a subordinate role in Morphy’s affairs, and chess historians are greatly beholden to Frederick Milne Edge for his factual accounts of the events which occurred while he was with Morphy, which was practically all the time Morphy was abroad. This writer would agree with Philip W. Sergeant, who states in his book A Century of British Chess “that my own reading of Edge did not lead me to think him a liar”. ‘Of course Edge now had much more time to himself. But it would appear that there were other reasons for Edge’s leaving Morphy of which the former never spoke. Nowhere in Edge’s letters to Fiske or elsewhere is there any satisfactory explanation for Morphy’s coolness toward Edge, who had labored so diligently and faithfully for him. In the letter to Fiske of February 10 mentioned above, Edge says that toward the end of January he had begun work on a book about Morphy. Without doubt he wanted primarily to give the world the story of Morphy’s trials and triumphs in Europe, such that he knew no one else could furnish. Hooper also set out his views on Morphy in the course of correspondence with us, and we subsequently reproduced some extracts. See C.N.s 3227 and 3235. Making a general point about The Companion, Fred Wilson wrote on page 114 of the 1992 American Chess Journal, ‘There appears to be a clear anti-American bias in the book’. The issue of national bias does, unfortunately, require consideration in the Staunton-Morphy affair. In an attempt to achieve balance in our own book World Chess Champions (Oxford, 1981), for the Staunton chapter we picked Coles (England) and, for the Morphy chapter, David Lawson (United States). That is not to say that divisions have been on strict national lines. Many, though not all, historians have striven for objectivity, and some of the sharpest anti-Staunton barbs have come from England. The chapter devoted to him in Hartston’s The Kings of Chess is entitled ‘The Pompous Years’. The Staunton-Morphy-Edge debate in Chess Notes continued until the magazine closed down in December 1989, and summarizing here the multiplicity of points discussed would be an impossible task. The contributions – often of outstanding quality – did not always make for easy reading, but there can be little doubt of the material’s importance for all future writers on the nineteenth-century trio. For ease of reference, the numbers of the C.N. items in the debate are: 840, 943, 957, 1012, 1031, 1124, 1149, 1172, 1228, 1269, 1270, 1358, 1416, 1417, 1439, 1440, 1480, 1499, 1569, 1570, 1633, 1642, 1643, 1669, 1700, 1722, 1757, 1758, 1818 and 1932. Moreover, Skoff submitted a 16-page letter dated 17 November 1989 which arrived too late to be included in the final issue of the magazine; copies were made available upon request to interested readers. Those words were written in 1989, and Diggle died some three years later. Throughout the 1990s the ‘Staunton-Morphy-Edge battle’ stood more or less adjourned, but around 2000 there were distinct signs of a revival of interest. The present article has provided a substantial quantity of information and views about the least-known of the protagonists, Frederick Edge, the aim being to ensure an informed debate on one of chess history’s most engrossing controversies. David Hooper’s assertion in the 1978 BCM that “Edge also found it profitable to invent baddies (Staunton, Harrwitz)” is quoted, but Diggle acknowledged in C.N. 1012 that Staunton’s “conduct in many respects cannot be excused”; moreover, Staunton himself ridiculed Harrwitz’s behavior (Lawson, page 132). Hooper’s review in the BCM identified no specific inventions by Edge that caused Harrwitz to lose his job at the Café de la Régence. Addition on 16 July 2005: A separate feature article giving the complete texts of two letters from Edge to Fiske discussed above. By that time we had, in any case, all but given up with K.W., on account of his persistent muddling and distortion of many matters, quite apart from the Edge-Fiske letter. At his best, he was one of the best; at his worst, he was one of the worst. Notes on the life of Howard Staunton by John Townsend (Wokingham, 2011) has just been published in a limited hardback edition of 100 copies. The book also contains carefully-researched material about some secondary figures discussed in C.N., such as T. Beeby, F.M. Edge and J. Worrell. Source: London Gazette, 29 August 1865, page 29. I write to ask the privilege of an interview from you for Mr Edge a Gentleman possessing a master mind which for many years he devoted to travel in America for the purpose of studying their Political principles, economy and window of action specially in relation to Slavery. On returning to England he was resolved to write a work “Slavery doomed” denounced at the time as extreme if not futile in its anticipation but there were thinking Christian minds who felt its truth and force – and not a few in the Political world who acknowledged its remarkable ability. Recent & culminating events in America have fully proved in rapid sequence how thoroughly Mr Edge had studied & was able to grapple with his subject and to forecast the course of events which are only now in their commencement. Mr Lincoln’s advent must lead to an almost entire re-organization which will seriously affect England. As an Englishman then I entreat you to see Mr Edge. I am sure he will afford you truthful valuable information and insight into the working and probable results of the present struggle. Knowing the value of your time and the pressure of engagements I would not frivolously trespass upon you but I am sure you would be thankful for the interview. Your Lordship’s most obedt. Servt. Asks interview for Mr Edge as a gentleman well acquainted with the state of America. Reference: PRO 30/22/39, ff. 34-36. I beg most respectfully that your Lordship will be pleased to accord me an interview believing that I am in possession of such information in reference to the present revolution in the United States as may be of service to Her Majesty’s Government. I should not presume to trouble your Lordship were it not that personal acquaintance with American statesmen and politics of all parties enables me to foresee many dangers menacing this country; while at the same time, I might be permitted to offer a suggestion which, if carried into effect, would relieve our manufacturers from much anxiety. Reference: PRO 30/22/39, ff. 37-38. The third letter was written by Stephen Bourne. Mr Townsend notes that Bourne, who died in 1868 aged 76, edited the World newspaper, which was incorporated with the Patriot in 1831. The last time I was at Chesham Place, I left with Your Lordship a book on the state of American Politics written by Mr Fred’k Edge. Since that publication Mr Edge has called on me several times. The day before yesterday he informed me that he was to see your Lordship as this day but as he owed the appointment to a personal friend who is connected with the Conservative party he fears he may be ranked as one of them. He has asked me therefore to state to your Lordship, what I believe, that he is on the Contrary an advanced Liberal. He is well informed on American Politics. I will take the liberty of calling at Chesham Place some morning in hopes of getting five minutes with you after breakfast as I have something to suggest on the same subject. Reference: PRO 30/22/39, f. 39. ‘Further to my short account of the libel case which F.M. Edge brought against Clayton in 1867 (see Notes on the Life of Howard Staunton, pages 119-120), I have learned a little of the background to the case. Although Edge had been released from the debtors’ prison about March 1866 (see C.N. 7483), his financial position continued to cast dark shadows over his life and was the cause of his departure from his job at the Reform League, which involved collecting money and retaining a percentage for himself, and the consequent libel action. A fairly detailed account of the case appeared in the Manchester Courier and Lancashire General Advertiser of 7 August 1867, page 4. 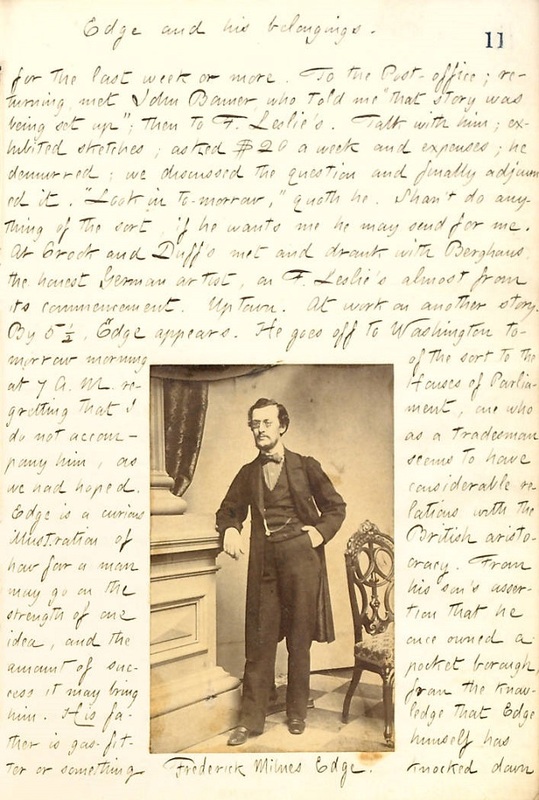 This included, incidentally, the full text of his resignation letter, dated 11 January 1867, which, in a chance remark by Edge, provides further evidence that he was married (“… I must now seek the means for maintaining myself and those dependent upon me …”). The identity of his wife remains a mystery. According to the newspaper article, his counsel made the point that the advertisement inserted by his employer to announce his departure was libellous because, by the manner of the League’s distancing itself from Edge, it created a situation in which any monies subsequently collected by him could be seen as not for the benefit of the Reform League at all and, hence, it would be thought that he was acting dishonestly. 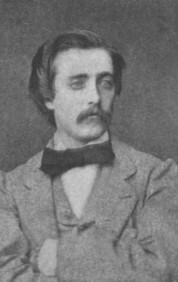 On page 5 of his book about Morphy (New York, 1859) Edge referred to his work for the Herald, and John Hilbert comments that although the index to The Civil War (page 799) merely refers to ‘Edge (Editor)’ it can hardly be doubted that it was F.M. Edge. ‘There is an entry in the International Genealogical Index which suggests that F.M. Edge’s parents, Thomas Edge and Eleanor Milnes, married at Manchester Cathedral on 29 April 1829, and I have checked the full entry in the Cathedral’s register. “THE HAMLET NIGHT. – It is respectfully announced that the representation of HAMLET will take place at the Academy of Music TO-MORROW, (TUESDAY EVENING) Nov. 27. Can further information about stage performances by Edge be traced? This new line of enquiry opens up the possibility of finding a picture of him. ‘I, by the assistance of little Edge, hunted up Carroll, and got particulars of Med. Student matters for book. Also I’ve visited a Chinese Boarding House – in Cherry Street. Book grows apace. Correspondence kept up, as wont. Source: page 65 of Reinfeld’s book The Great Chess Masters and Their Games (New York, 1952 and 1960). The text was on pages 71-72 of the UK edition, The Human Side of Chess (London, 1953). Latest update: 30 April 2017.